You might find it interesting to know that Dr. Lynda and Dr. Chuck are childhood sweethearts since they were freshmen in high school, and married in 1981. They grew up in the rural heartland of Illinois in a farming town much like the area we live in here in Vermont. They were inspired to choose dentistry by an interesting twist of fate: Dr. Lynda's father was a wonderful medical doctor who devoted his life to his patients, but the family rarely saw him because he was so busy. Conversely, Dr. Lynda's neighbor was a wonderful dentist who would drive into his driveway at 6 pm sharp every evening. Dentistry seemed like a better profession for people who wanted a happy family life. Eventually both of our doctors graduated from the University of Kentucky with Doctoral degrees in Medical Dentistry in 1987. For sports enthusiasts, you might find it interesting to know that Dr. Chuck played basketball for the University of Kentucky and was the team Captain in 1981 and 1982. Dr. Chuck was one of the top 20 high school All-American players in 1978. In those years, Kentucky was the perennial powerhouse of college basketball, winning the NCAA finals the year that they recruited him. Dr. Chuck played against the likes of Michael Jordan, James Worthy, and Charles Barkley. He was always given the toughest defensive assignment on the court because of his smarts and hustle. Chuck was drafted in the 7th round by the Chicago Bulls, but by then, the couple was overwhelmed by the drama and intensity of "big time basketball." They decided to have an adventure and Chuck chose to play professionally in Spain before they went on to dental school. For months, Dr. Chuck was one of the leading scorers and rebounders in Europe, and the future looked secure for a long, fruitful basketball career, but the fates intervened and Chuck's basketball career was ended by a catastrophic broken Achilles Tendon. This sent Lynda and Chuck back to the USA to complete their long-term educational goal of becoming dentists. Following dental school, the couple took on another adventure: they moved to Italy to take over a dental practice in the town were the Ferrari Automobile plant is located. When they returned to the U.S., Lynda and Chuck chose to settle in Vermont because of the area's familiar rural quality of life and their love of the outdoors. And here they are today, just delighted with the way things turned out. If you want to hear the longer story of Dr. Chucks basketball career, check out his bio over on EverWideningCircles.com, a website Dr. Lynda and he started to help show people "it's still an amazing world!" Liesl, (second from left in the photo below) is a recent graduate of Harvard and runs an inspiring global website that Dr. Lynda founded in 2014. (Check that out at EverWideningCircles.com if you'd like to see hundreds of articles on the positive news happening in the world.) Liesl has her parents' artistic eyes as well and has been one of the largest single donors to our local battered women's shelter by selling her interesting photography at PhrogEyePhoto.com and giving the shelter the proceeds. Louisa, (far left) is a high school senior, and well-known in our region for her enormous, amazing metal sculptures. She has donated most of the proceeds (over $20,000) to local charities over the years. You can see her fantastic art at BEaSPARK.com and a blog on Nature that she writes called ArtOfNoticing.com. Jens, (far right) is a high school sophomore, who has taken after his father at 6' 5", playing basketball at the highest levels. He's an eager scholar, loves poetry and leadership, and aspires to go to Harvard to become a Physician who works in global health and humanitarian areas. Here they all are right before the University of Kentucky played in the Final Four basketball game recently. Dr. Chuck kept all his old gear, and suited everybody up for the occasion. Here is a speech Liesl gave at Harvard about confidence and body image. Louisa has been incorporating her love of science and art into an education pathway she has pioneered for our local high school, BFA. She has documented this unusual educational journey at BeyondTheXtraMile.com. You might also find it interesting to know that Louisa's impulse to "give back" stems from her sense of gratitude: she started life as a 4 month premature baby, weighing only one pound! Dr. Chuck and Dr. Lynda have a passion for gardening, wilderness canoe-camping, and the natural world. They have been wildlife rehabilitators for many years. In fact, they have worked with the Vermont Department of Fish and Wildlife as the only licensed home for orphaned moose calves, raising 4 moose calves over the years successfully. This is the second baby moose that we raised. named ziggy. we found that the calves thrived as long as they were rarely left by themselves, so we took meals out on our deck as much as possible to include them in "family life." Moose can not be raise and released into the wild because they imprint on humans easily. I found a home for this little fellow at the MILWAUKEE Zoo, where he eventually became the oldest living moose in captivity. He had a wonderful life and we were proud that he was there to teach many visitors about the wonders of North american wildlife. In our first decade here in vermont, Racoons, fawns, baby foxs, orphaned porcupines and almost any other creature, were common features around our house and yard. we developed some very valuable techniques to eventually see that All but the baby moose were raised to successfully go back to the wild. 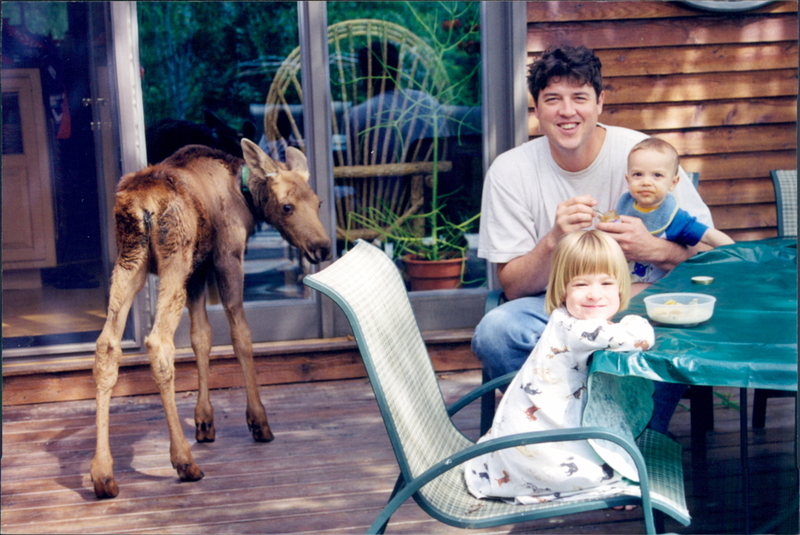 This was our first baby moose, Clifford! He found a great home in a north american wildlife park in MINNESOTA where he was essentially free to roam over a vast track of land. You might also know that Dr. Lynda started this tradition in her family of making giant metal sculptures some 25 years ago. She make large metal sculptures with found objects and junkyard metal pieces too! Lynda learned to weld on the family farm while growing up and in the early 1990's at our local Adult Learning courses, she mastered the finer points. Since then, Dr. Chuck has had an easy task when buying birthday and Christmas presents - What woman in her right mind wouldn't want a Plasma Cutter, or a new Acetylene Torch tip?! A tour of our yard and garden is a lesson in true recycling - life imitating art! At our home they have about 30 sculptures made from a wild assortment of metal tools, machine parts, and other scraps.You can see more of Dr. Lynda's artwork by clicking here. Fun fact, Fiddlehead Dental is a bit of a landmark in St. Albans because of the Dinosaur Dr. Lynda built - a life-sized Stegosaurus named "Fern" - in the front yard of the office! At the office, in July of 2010, Dr. Lynda's 12 year old daughter and she built a life-sized Stegosaurus, whose head and tail move in the breeze. You can drive by and see it from Congress Street. In the final analysis, our life experiences have taught us to look at every day and every patient visit as a gift. Chuck and Lynda are about relationships, meaningful work, and connections with their patients and team. High-quality relationships and high-quality dental care are not accidents. Dr. Lynda and Dr. Chuck enjoy maintaining rigorous continuing education schedules and very often take as much as 3 times the amount of continuing education coursework required for licensing in Vermont. In fact, Dr. Chuck has served the Vermont State Board of Dentistry for years, where he helps oversee the quality of dental care that all Vermonters receive. Dr. Chuck is past president of the Vermont State Dental Society and remains active in that organization whenever he is called upon. In the winter of 2014, the doctors embarked on yet another adventure, this one would be an effort to change the world a little. They had gotten so tired of the negativity of the 24-hour news cycle that they decided to do something about it: Dr. Lynda created Ever Widening Circles, a place on the web where people around the globe can go for positive, fact-checked articles about the good things in the world we share. We write about great people doing remarkable things in science, art, music, sports, technology, philosophy, and almost any subject you can think of. Two years later now, the website is visited by 50,000 people each month from over 190 countries. Check it out if you want a spring in your step! Our whole team is committed to seeing that you receive the finest skill, care, and judgment in a warm, friendly environment where comfort, conversation and laughter are a priority. We have made extensive study of leadership and business management for 25 years and are alumni of a 7-year dental management program based on the principles of the Harvard Business School. For this reason, we hope that you will always find a refreshingly eager and knowledgeable team waiting to serve at Fiddlehead Dental with exceptionally good management and communication systems. Our goal is to work with you in a collaborative relationship to see that you are able to attain, maintain, and enjoy a beautiful smile for a lifetime.